This is Feebe. She is 17 and she lives outside of Gulu in northern Uganda. 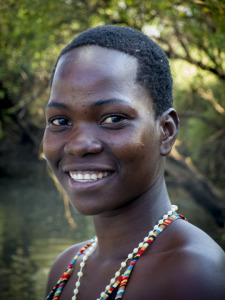 I met Feebe when I found her waist deep in a muddy backwater trying to catch fish with a woven wooden basket. Working along the steep banks and under the overhanging vegetation Feebe waded barefoot through the brown water sluicing the still river for fish that weren’t there. Feebe knew there was no opportunity for her in Gulu. At 17 she knew that her horizons stretched far beyond Gulu. “There is nothing here for me,” she told me, “I am the best student in school but it’s not enough, I need to leave.” She knew that she had as much a chance of finding a future in Gulu as she did of finding a meal in that dirty water. This is Daniel. 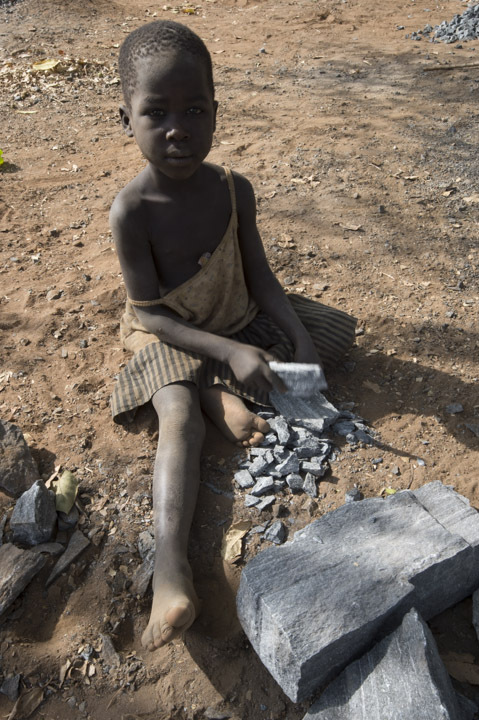 He is 10 and he also lives outside of Gulu. He should be in school but instead he is pounding rocks; all day, hammer to stone, pounding rocks, making gravel. 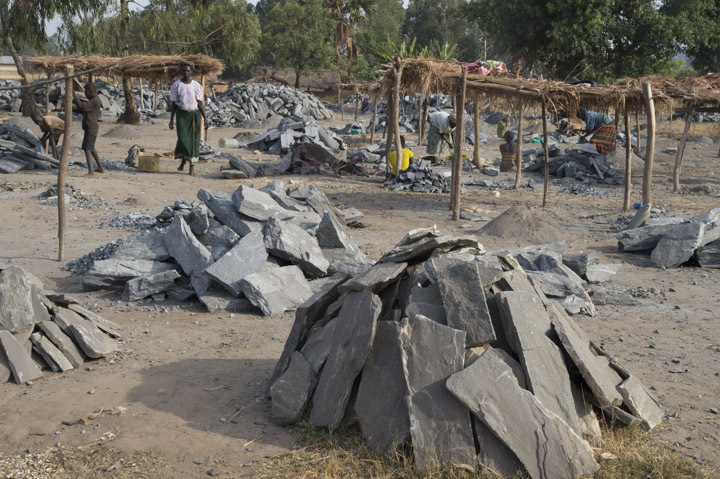 I met Daniel at a quarry organized as a woman’s cooperative where his mother also worked. She carried blocks of rock, two at a time; maybe 30lbs total, on her head up the dirt quarry wall to a pile next to her son. On a good week, they might make a profit of $5, together, working six 10-hour days. Daniel had about as much chance of getting out of that quarry and going to school as he did in buying a jackhammer. Daniel didn’t know another life, he didn’t know what a classroom was like, what recess meant, why you would raise your hand when a question was asked. 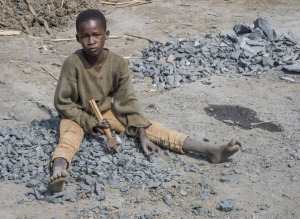 He knew this quarry and he knew he was earning money to feed his family. He knew work, he knew rock, he knew all-day. Daniel knew nothing of opportunity, nothing of distant horizons. He saw no wheelbarrows, no tractors, no trucks, no motors, no machines to ease his labor. In the quarry he was a cog, just a little boy cog, a piece of a gravel-making machine, a machine powered by biceps, back and grit. For Daniel there was just a hammer and a pile of rocks. For Daniel is was always hammer to rock, breaking large to small, small to smaller. Daniel was one of many boys and girls in that quarry, caught at 10, or 12, or 9 with hammer in hand, sitting on a pile of broken rocks and ragged days. From where I sat Daniel was blank, expressionless, going through the motions of life as labor. To me, he seemed as lifeless inside as he was dusty and torn out. I was the person that could’ve taken Feebe to her far horizons. I had the means, I had the brains to make it happen but I didn’t have the time. My schedule was more important to me than her dreams. Too busy, too self-important, too wrapped up in my big world to help her out of her little world. It took me 40 hours to fly home to my side of the planet, my affluent world, and a world she will never know. In 40 hours she was back in the muddy river, straining the brown water for morsels to eat, finding only disappointment. And I was the person who could’ve put Daniel in school. For $150 I could’ve paid for a year of school and perhaps a new path out of the quarry. I had three 50’s in my wallet, three 50’s that I could replace at the next ATM but they stayed in my wallet and I took my pictures and I drove away. I spent the next week sitting in the back of a Land Cruiser, sitting in chairs at restaurants, sitting in an airplane on a flight to another world. 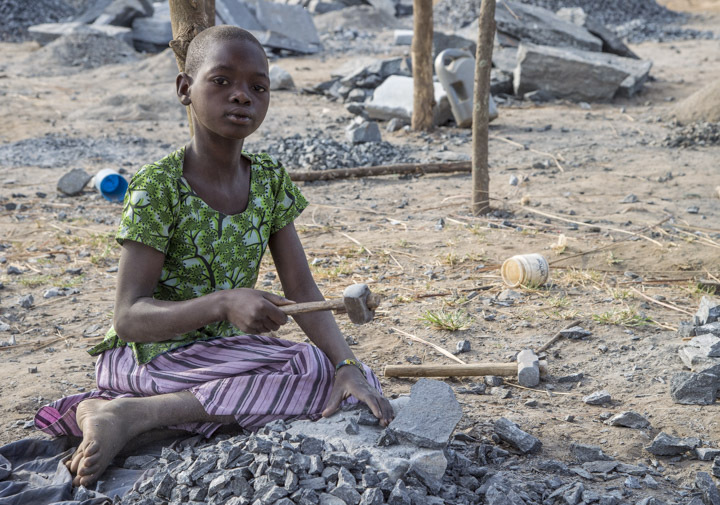 Daniel spent that week sitting in rubble; hammer in hand, hitting rocks, shattering his dreams. When will Feebe’s desire to leave meet someone with a desire to take her away? When will she meet someone with only desire- only nauseous, twisted desire? A hand is extended, an arm is twisted, and the desire of a predator’s poisoned greed and sickness is realized. When will Daniel move on to other hard labor, sold for his taught muscle and soft demeanor to bring food to another’s table? A desperate mother, an absent father, a life of despair cashed in for a bag of beans and a side of goat. This is human trafficking. These are the children of human trafficking. Not imagined, not abstracted, not obscure but real people, real children. Look at their faces, do it. Peer into their eyes. In one there is hope, in the other resignation. It doesn’t matter. They are the fodder of prostitution, forced marriage, domestic slavery and forced labor. Look again deeply at their faces, do you see a soul? For $20 bucks it can be yours. I have appreciated you for your skill as a teacher and practitioner of photography. I find you to be a pretty nice guy and I enjoy working with you. This series in your blog shows a sense of humility that I have missed. You are what a good person is all about. What’s this ‘pretty nice guy’ business? You can call me almost anything but please, not a nice guy! Trying to ruin my hard earned reputation? People might start to think that critiques could actually be fun and helpful! I’ll get back to my old grumpy self pretty soon, promise!! OK, I am now touched by the story. I want to help change the life they have going forward. Where de we start? I have some friends, you have some friends, my friends have some friends. Please lets make the lives of two people better. Let’s come up with a plan! Thank you Rich, thank you very much. Yours is not the first comment on helping these two children but it is not an easy solution. There are so many layers, so many issues. If Daniel leaves, he reduces the amount of money his family has to buy food- does this mean his sisters and brothers eat less, are at greater risk of starvation or disease? Same for Feebe- she is a primary income earner and provider for her family. What happens if she leaves? What are the repercussions? So many many ways for very well intentioned money to be misused, have unintended consequences, thrown away. This is not to say that I have given up- I’m not that kind of a person, I just don’t know right now what is the best way to make this right. I am asking smarter, more experienced friends about this and I will let you know. I will also blog about this very shortly. Helping Daniel and Feebe may not be possible but helping other children in northern Uganda will be. I have some thoughts, just want to make sure they are going to be effective. There is a saying by those who work in Africa that sums all this up- ‘Africa Always Wins’. This is said in frustration not celebration- it refers to the layers, odd consequences, unexpected outcomes that are characteristic of trying to do anything in Africa. I don’t plan and saying it. Promise. I have “enjoyed” your critiques. To this day even Greg says ” you know what David would say” as I delete images. I had tears in my eyes from reading about Feebe and Daniel. I would bet you did too but probably thought it was the dry air and dirt. Having grandchildren the same age brings their circumstances so close to home. I will continue to see what you come up with as a way to help.